The senior fired an even-par 36, while defending champion Camden and Oceanside won the conference titles. ROCKLAND — As far as Gavin Dugas was concerned, his rocky relationship with the rolling Rockland Golf Club course was history. 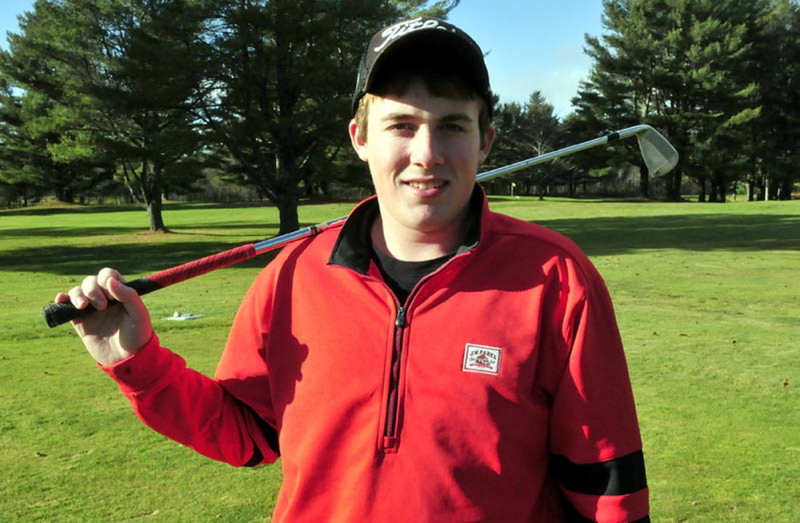 The Maine Central Institute senior didn’t let the course intimidate him Thursday, settling in early and firing an even-par 36, the low score in the Kennebec Valley Athletic Conference Shootout. Staff file photo by David Leaming Gavin Dugas won the Kennebec Valley Athletic Conference Shootout on Thursday by carding an even par 36 at Rockland Golf Club. Dugas’ day wasn’t enough for the Huskies to unseat defending champion Camden Hills, which had five of six golfers shoot under 42 to cruise to the title, 159-169, over MCI, and earn an automatic bid to the state team championships on Oct. 11 at Vassalboro GC. Gardiner (175) finished third while Erskine Academy (185) was fourth. After earning a par 5 on the first hole, Dugas hit a brilliant approach shot at the 378-yard par 4 second, sunk a short but tough birdie and found his rhythm for the remainder of his fairly clean round. Erskine’s Cameron Grass tried to make him uncomfortable with an even better approach at the par-4 sixth, holing an uphill chip-in from about 100 feet for a birdie that pulled him within a couple of strokes of Dugas with three holes to go. Grass’s drive at the 485-yard par 5 seventh struck a tree. The senior got up-and-down to salvage bogey en route to a 4-over 40, matching MCI’s Carter Pearl, Daulton Wickenden, who joined Dugas and Grass in the first group, and Justin Starbird of Camden Hills for third place. Jared Garske of Camden Hills shot a 38. Brian Dunn, the final member of the first foursome, led Gardiner with a 6-over 42. The junior said he needed a couple of holes to adjust his putting after playing in Wednesday’s semifinal at The Meadows. Other low scorers for MCI were Eric Dugas (42) and Nate Tilton (51). Seth McFarland (43), Chad Prince (45) and Michael Glazier (45) rounded out Gardiner’s top four. Robert Harmon (48), Aaron Pion (49) and Trevor Browne (50) completed Erskine’s team total. Oceanside (162) won the Class A Shootout over Oxford Hills (166) and Bangor (176).